London 1899. Just before the turn of the century, the city is gripped in the throes of a crime wave. Scotland Yard is overrun with cases, so they must rely on outside help. That’s where you come in. As one of the world’s best detectives, you must interpret the clues and solve the case before your competition. Did the Countess commit an unspeakable act in the Theatre? Perhaps the Duke made use of a Crossbow in the Museum? Dangerous criminals are on the loose and the game is afoot! In 13 Clues, you take on the role of a master detective trying to solve your own case. You’ll need to identify the culprit responsible for the crime, the location it took place in, and the weapon they used to carry it out. You start out with a hiding screen, one Magnifying Glass token, a pencil, and your trusty Casebook to record your findings. All the elements of the crimes are represented with cards in three different decks, consisting of Persons, Locations, and Weapons in ten different colors (some of the colors are removed for groups of less than six players). Locations are either Indoor or Outdoor, People are either Male or Female, and Weapons are either Up Close or Ranged. These are important details to know when trying to solve a case. Everyone is dealt one card from each deck and then two random cards, with the leftovers forming the face down Secret Informant cards in the center of the table. From your hand, you select the elements of the crime for the person to your left while the player to the right selects the elements of your crime. This leaves you with two extra cards hidden behind your screen. You’re given one card from each deck (Person, Location, and Weapon), but instead of looking at the cards, they’re placed in their hiding screens facing away from you towards the center of the table. All the other detectives can see the details of your case except for you. In turn, you’ll be able to see the details of the cases your rival detectives are trying to solve. Each turn, you’ll either investigate your case, or make an accusation in an attempt to solve it. Actions cost one of your Magnifying Glass tokens to execute, and you must spend all of your tokens each round. Questioning Witnesses is when your real investigative skills come into play. You pay a rival sleuth one of your Magnifying Glass tokens and ask them a question about the cards they see. You can ask how many cards of a certain color they see or how many cards of a category they see. For example, you can spend a Magnifying Glass token to ask an opponent how many red cards they see, or how many Outdoor Locations they see. They must respond honestly, but their response includes the two cards hidden behind their screen. You can also choose to Consult the Secret Informant. Pay a Magnifying Glass token to a player who doesn’t have any, and then covertly look at one of the Secret Informant cards in the center. As your investigation progresses, you can track what you learn in your Casebook, eliminating the impossible and zeroing in on the scene of the crime, the guilty party, and their weapon of choice. When you think you have all the information you need, you can Make an Accusation, naming a Person, Location, and Weapon. If you’re right, you’ve closed your case and win the game. One more criminal behind bars! If you’ve made a mistake, your turn is over and the case remains open. Just like a real crime, there is a lot of missing information at the start of 13 Clues. You must ask the right questions and get helpful information from the other detectives. The better you are at interpreting the clues you get, the faster you’ll solve the case and put a criminal behind bars. 13 Clues puts your reputation as a master detective to the test. Listen to the responses you get, read the information at your fingertips, and above all, observe everything. The answers to your case are all around you, but do you have the skills to find them? 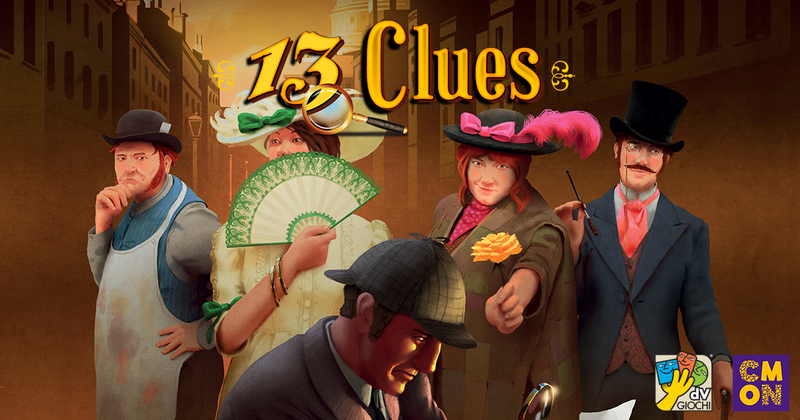 13 Clues is available in your FLGS today! This article was originally published in GTM Magazine. More information here.